You have an allergy to chicken eggs or egg proteins since the flu vaccine is grown in eggs. You currently have a fever or an acute illness beyond a simple cold. Arrange to get the vaccine once your illness has gone away. You have ever had a reaction to a previous flu vaccine. Crankiness, irritability, general malaise - Children, in particular, may be susceptible to feeling low after getting the vaccine. Just remember that one day of crankiness isn't nearly so difficult on you or your child than many days of having full-blown flu. Soreness and pain, like muscle aches - these are local reactions that may result from the injection itself, but usually go away quick quickly. Allergic reactions like hives or anaphylactic shock (whole body reactions like fainting, abdominal cramping, trouble breathing, confusion) - these are usually caused by an egg allergy or possibly a latex allergy that was previously not detected. People who have received H1N1 swine flu vaccine have also reported mild fever, muscle aches, nausea, headaches and other, milder side effects such as those listed above. Learn more about flu vaccine side effects in children from our Guide to pediatrics. Also, should your child exhibit side effects after a flu shot, the CDC recommends you not give them aspirin. Aspirin should never be given to children under age 19 because they run the risk of developing Reye's Syndrome. One rare possible reaction to flu vaccine is Guillain-Barré Syndrome (GBS), although it is very rare. However, this risk is very small. In 1973, there were some reported cases of GBS after the 1973 swine flu shot, but the cause and effect remain a bit controversial. Current flu vaccines are produced differently and the 1973 experience has not been repeated. Further, the risk of GBS is far outweighed by the prevention of mortality and morbidity from flu. Learn more about Guillain-Barré Syndrome from the CDC. There has been one publicly reported side effect called dystonia, which is involuntary contractions of one's muscles resulting in twisting and repetitive, sometimes painful, movements. So far that report is unproven. If you run into extreme side effects or problems with any sort of vaccine, including the flu vaccine, there is an opportunity to not only report those problems but to potentially be compensated for some of your injury. Learn more about The VICP - National Vaccine Injury Compensation Fund Program. Thimerosal was first used in the 1930s to prevent contamination in multi-dose vials of all types of vaccines. In 1999, most thimerosal was removed from childhood vaccines due to fears that it caused life-long negative side effects such as autism. That fear has now been disproved. 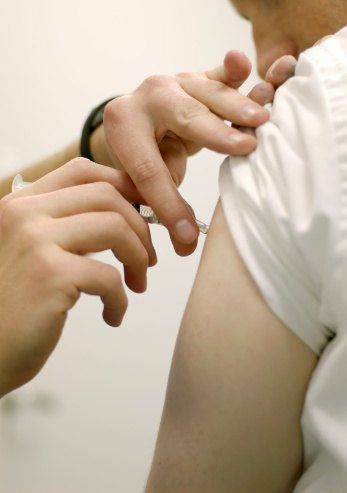 However, fears still linger and many parents are reluctant to let their children be vaccinated. Yes, thimerosal is one ingredient used as a preservative in trace amounts in seasonal and swine flu multi-dose vaccines. It is not included in the individual dose vaccines. Parents are advised to talk to their doctors about any potential risks from thimerosal vs. the risk of a child suffering or dying from contracting the flu. If you have nervous friends, you no doubt have received emails that predict that the flu, and the vaccines to prevent it, may signal the end of the world as we know it! Yes, the flu is a difficult disease, and yes, people die from it for many reasons, especially when they can't or don't take care of themselves. Further, crooks and conspiracy theorists capitalize on peoples' fears to make money or draw attention to themselves. If you have a fear about any flu, seasonal or swine or any other, you'll be wise to educate yourself, and understand why those theories get started and which ones are, or aren't true. You can also learn how to confirm or debunk them for yourself.